Zhang Zhong Shan is an ABC, American Born Chinese – except he is not really: his father is Chinese, but mother is Latino and he was genetically-engineered to appear pure Chinese. He is also gay. He works as a construction technician in New York in a United States dominated culturally, economically and politically by communist China. Zhong Shan translate roughly as “China Mountain” and is also the Mandarin equivalent of the Cantonese Sun Yat-sen. It is considered a name worth remarking on: as Zhang himself says, “To be named Zhang Zhong Shen is like being named George Washington Jones” (26). China Mountain Zhang is the story of Zhang, opening in New York on a construction site, and finishing in New York with Zhang working as a freelance organic engineer. In between, he spends time on Baffin Island and at university in Nanjing. The narrative also breaks away from Zhang on several occasions to tell the stories of Angel, a kite-flyer in New York, and Martine, a settler on Mars. Though both narrative threads seem unrelated, by the end of the novel they have touched, or have been touched by, Zhang. Not one of the characters changes the world though their lives do so. But neither is this a novel of accommodation – no one changes to in order to fit better. In fact, Zhang finds himself less employable, having qualified as a construction engineer, than he had been as a construction tech. And despite homosexuality being illegal in both the socialist USA and China, Zhang never questions his sexuality. And yet he questions his racial identity repeatedly. He is not really Chinese, though he appears to be. His mother named him Rafael, and he still uses the name among some of his friends. As China Mountain Zhang opens he has been invited to the home of his foreman Qian to meet his daughter. Qian is Chinese but has fallen from grace and been exiled to the US. He does not know that Zhang is not wholly-Chinese, nor that he is gay. Trapped in the identity he presents to Qian, Zhang reluctantly meets Qian’s daughter, San-xiang, and takes her out. They become friends, of a sort – she imagines more to the relationship than is ever going to be the case. In a later break-away narrative, Xan-siang, who is not attractive – “She is astonishingly ugly. More than ugly, there is something wrong with the bones of her face” (p12) – has cosmetic surgery to correct her appearance… only to fall victim to a predatory man. Her ugliness had protected her, and now she is pretty she does not have the social skills to cope with the attention her looks now cause. Her story is the one unhappy one in China Mountain Zhang. But before that, Xan-siang runs away from her parents and goes to stay with Zhang. Her father tries use to this to force them into marriage, so Zhang reveals he is half-Hispanic. Qian fires him. Which is how Zhang ends up working on Baffin Island. There, Zhang’s identity – racial or otherwise – is mostly irrelevant. The scientists of the station are more interested in their jobs. However, Zhang’s six-month stint there does qualify him for special entry into a university in China. Which is where he qualifies as an organic engineer. The sections set in Nanjing don’t seem to quite gel as effectively as those set in New York or even on Mars. Zhang is a foreigner, though he does not look like one, and his personal interactions appear mostly limited to his tutor, also gay and with whom he has a relationship. Admittedly, China Mountain Zhang is Zhang’s story, told from his point of view, so perhaps that’s unfair. Perhaps too it’s because Nanjing follows Baffin Island, and Baffin is a very limited environment. Martine’s narrative, set mostly in her holding on Mars, initially seems to belong to a different novel. A link with Zhang eventually appears, but it is peripheral. Martine is an ex-soldier, now land-owner, on a collectivist Mars. A chance encounter with a new settler and his young daughter – both are living in dorms and have no credit and so cannot afford a parcel of land – brings Martine out of her self-imposed seclusion. There’s actually little in the narrative thread which demands it be set on Mars, other than a need for a society on which China has little or no direct influence. There is a strand of utopianism to China Mountain Zhang. The world McHugh has built is by no means perfect – homosexuality is illegal, for example – but neither is it as unfair or unequal as the real world. It is, however, mostly prosperous and advanced – I think the story is set somewhere near the middle of this century, though I don’t recall an exact decade being named – but the world of the book has settlers on Mars, and people can “jack” into tools and computer systems. Inasmuch as it carries the story, I found it convincing; but then I’m not wedded to capitalist ideals so I will happily accept a world built on alternative principles. China Mountain Zhang was very well regarded when it first appeared. It was short-listed for the Hugo and Nebula, and went onto win the James Tiptree Jr Award and Lambda Award. Not bad for a first novel (in fact, it came top in the Locus Poll that year for Best First Novel too). 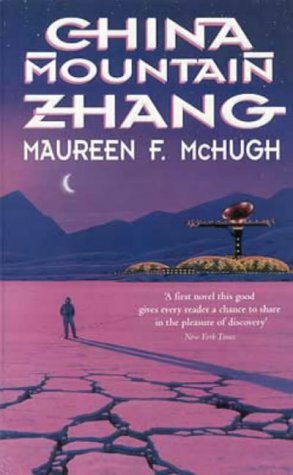 On the strength of China Mountain Zhang, a very good novel, I certainly plan to seek out and read more of McHugh’s fiction. Good start to the blog! I have this book here and never read it – already put it in my to-be-read pile!! Excellent Rreview. China Mountain zhang is an excellent book. Nothing else Ms McHugh wrote is nearly as good.